The severe winter storm that began Friday, January 22, and continued through Saturday, January 23, affected energy infrastructure throughout much of the eastern United States. Heavy snowfall, high winds, and ice knocked out power to more than one million customers in states from Arkansas to Massachusetts. According to the U.S. Department of Energy's Energy Assurance Daily from the Office of Electricity Delivery and Energy Reliability, power had been restored to almost all customers as of midafternoon January 27. The storm produced record snowfall in many areas, with at least 14 states receiving more than a foot of snow, and it brought blizzard conditions and coastal flooding to many Mid-Atlantic states. Twelve states and the District of Columbia declared states of emergency in advance of the storm. Several of the states specifically cited heating and transportation fuels in the declarations, waiving hours of service regulations for truck drivers delivering heating fuels and other essential services in affected areas. Utilities in affected regions prepared for the storm by bringing in extra crews to deal with potential power outages. The most common infrastructure-related effects were power outages. 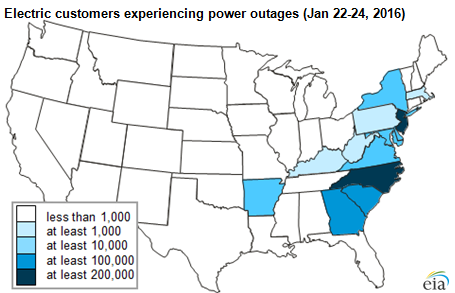 Duke Energy was the utility with the most outages, with nearly 500,000 customers losing power in North Carolina and South Carolina. Since Friday, the company has had 7,000 personnel working to restore power. About 2,200 Duke Energy customers were still without power as of Tuesday afternoon. Natural gas demand in storm-affected regions was slightly higher as a result of the storm, but prices remained relatively stable, in contrast to the record-high prices many locations in the Northeast experienced during the extreme cold weather in January 2014. Natural gas production also remained relatively stable, with no reported freeze-offs as a result of the storm. Other energy infrastructure on the East Coast affected by the winter storm included several ports along the Atlantic Coast, as well as an oil refinery in Delaware. PBF Energy's Delaware City refinery was in the process of restarting operations on Sunday after the blizzard caused a power outage at the facility over the weekend. The refinery has a capacity of 190,000 barrels per day and accounts for 15% of the East Coast's total operable refining capacity. It was the only refinery that reported storm-related problems over the weekend. Despite the overall severity of the storm, energy infrastructure was not as heavily affected as it was when Hurricane Sandy hit the East Coast in October 2012. Sandy knocked out power to 8.5 million customers, many of whom faced outages longer than a week, and damaged fuel distribution systems and crude oil and petroleum product terminals in the region.